Note: While this review will be spoiler free, it will make reference to previous books in the series. If you haven’t started yet, check out VBC’s review of book 1, Soulless. Having been on somewhat of a historical kick lately I thought it was high time I picked up the second Parasol Protectorate installment Changeless. I thoroughly enjoyed the comic nature of this Victorian-set fantasy world in the first book and I have to say, after finishing this one, I’m more than a little cross with myself that it has taken me quite so long to dive back in. Lady Alexia Maccon, formerly Tarabotti, has settled in her role, both as Muhjah of Queen Victoria’s shadow council and Countess of Woolsey. Married life is treating her well and she has quickly learnt the ropes of being Alpha female to the London pack. All is going swimmingly, that is until a strange plague befalls the supernatural community in London. Overnight all seems to have been retuned to their human states, vampire and werewolf alike, and not a single ghost remains. On top of that, her husband Lord Conall Maccon has been recalled to Scotland on mysterious family business, without so much as a “Goodbye wife!”. Never content to be on the sidelines, Alexia sets out to unravel the mystery of this mass humanization. What follows is another hilarious installment filled with eccentric French milliners, star-crossed (and altogether ridiculous) lovers and perilous dirigible rides to the highlands. Although always a pragmatic character, it was nice to see Alexia’s intelligence and wit being full appreciated now that she is away from the snide comments of her family and flourishing in her new job. Conall may tease her about being bossy and interfering but he clearly loves her. She continues to be forthright (occasionally to a fault) and practically unflappable in some fairly dire situations and I have to say, she’s fast becoming one of my favorite leading characters. Once again Ivy provides some comic relief with a seemingly doomed love interest (and hideous hats), and some of Alexia’s one liners directed at her really had me chuckling. The introduction of Madame Lefoux, a French lady favoring men’s fashion, was an interesting addition, particularly as she isn’t entirely trustworthy. Sadly the outrageously flamboyant Lord Akeldama and long suffering Professor Lyall weren’t as prominent here and at times I missed their dynamics with the major characters. 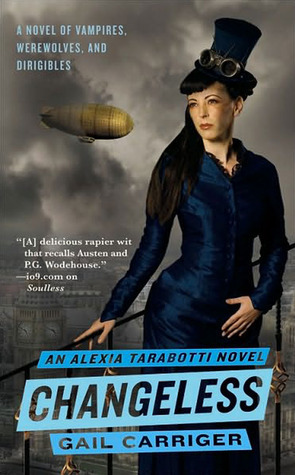 The action and plot utilized the detailed world building with plenty of mystery to go around in Changeless. While I had a strong suspicion as to the ‘who’ in some cases, the ‘whys’ and ‘hows’ remained a surprise until the end. The pacing was slightly slow in the middle though, with the last quarter feeling quite dense. I had to read very carefully so as not to miss crucial details and sometimes the science based explanations and inventions began to blend into one. Being a werewolf fan, I really liked seeing the inner workings of both the London and Scottish packs. There were also some interesting preternatural revelations that have certainly wet my appetite for future books. Changeless was colorful and deliciously over the top fun, packed full of humorous dialogue and larger than life characters that come together for a very enjoyable read. The shocking ending will no doubt shake things up and Alexia has some real challenges (and injustices) to tackle in the next book. On to Blameless! I really enjoyed this series. This review makes me want to go back and re-read!